Gud morning all.....!!! This post is delivered based on a request. Even though the request is comment form, i would like to deliver in full length, because while trying to learn about this on my own, i found its depth. For getting all those that i'm delivering may be you need to go through some terminology, which will be useful to easily what i'm delivering. What is NPSH & What does it mean exactly ? It is just difference between Suction pressure and Vapour pressure. NPSH = Ps - Pv. Ps - Stagnation suction pressure at the pump inlet while pump is in running condition. Pv - Vapour pressure of the solvent that is pumped. What is Stagnation suction pressure ? 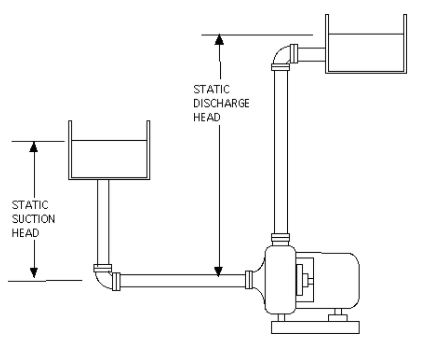 Stagnation suction pressure is the static pressure at a stagnation point there the fluid velocity is zero. What is the relation between Pressure and Head ? Head,h(feet) = 2.31 x P(psi) / SG. P - Pressure, SG - Specific Gravity. Don't get confused, i'll explain you from where i've established this equation. Usually Vapour pressure shall be expressed in absolute scale, So suction pressure also be expressed in absolute scale, and we got a basic relation between Absolute pressure, Gauge pressure & Atmospheric pressure. Absolute pressure = Gauge pressure + 1. All the pressure units were in psi. Usually everyone knows cavities in nothing but holes and thats for solids, while coming for liquids cavities is nothing but just air bubbles. Even they may effect the pump mechanical seal. How to avoid the cavitation ? 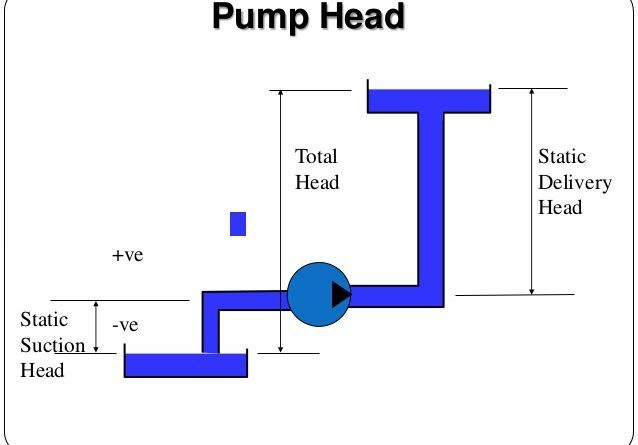 By arranging the suction and discharge line in such a fashion that the pump should be possibly near to the suction receiver and the discharge line size should be 15-20% less than that of suction line, so that there may be chance for healthy pressure development in the discharged. How liquid Velocity effects the pressure ? Mostly everyone thinks that if pressure increases the velocity shall increase, but as per me that not right, because if pressure increases it means whatever the flow that was initiated by a pump is not getting getting pumped through the line, so the velocity and pressure both are inversely proportional. Head is nothing but just pressure, let me clear you in detail, Usually the pump capacity depends upon the Impeller dia and impeller RPM. The pressure we get depends on the Specific gravity of the liquid. = Millimeters of mercury / ( 22.4 x SG ). What are the types of NPSH ? 2. NPSHA - Net Positive Suction Head Available. 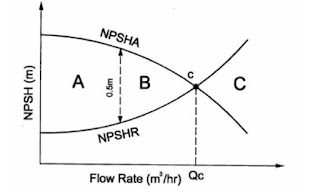 NPSH = Static head + Surface pressure head - Liquid vapour pressure - Loss in the piping, fitting, valves. Static head - it should be measure from the centerline of the pump suction to the top of the liquid level. Vapour pressure of the product, for your convenience here i'll present you two graphs for absolute pressure vs temperature. Note: These graphs were grabbed from google images. Loss of pressure due to fittings, valves & piping. find the below charts, with resistance Coefficients. Use the formula h = V^2 / ( 2 x g ), feet of liquid. Now lemme demonstrate the with some basic examples, because gathering information is just a beginning, but utilising them and analysing the case studies in much more important. In 1.25" pipe size at 50 gpm, there will be 36.0 feet of loss for every 100 feet of pipe. Pressure loss due to friction in 2.00" to 2.50"
Lets suppose the tank having liquid is at sea level and the liquid is 10 m above center line of pump impeller and coming to piping its a 15ft of 2" and a included 90° elbow bend, pumping 150 gpm water at 68°F, NPSHR is 12 ft.
Atmospheric pressure = pressure x 2.31 /SG = 14.7 x 2.31 / 1 = 34 ft absolute. 150 gpm flowing through 2" shows a loss of 38 feet for each 100 ft of pipe line, i.e, 38 / 15 = 2.53 feet of head loss. Clubbing the whole feet of head loss will give us 2.53 + 0.6 = 3.13 ft. The NPSH required is 12 ft and we are able to generate 40.25 ft, so this is more than enough for pumping. Hope everyone able to grab this, if any queries feed free to comment / message. How to calculate Heat transfer area theoretically ? How to produce steam at 60 C ? How to Design a chiller plant ? How to calculate U (Overall Heat Transfer Co-efficient) value ? How do you know the NPSHR is 12ft? 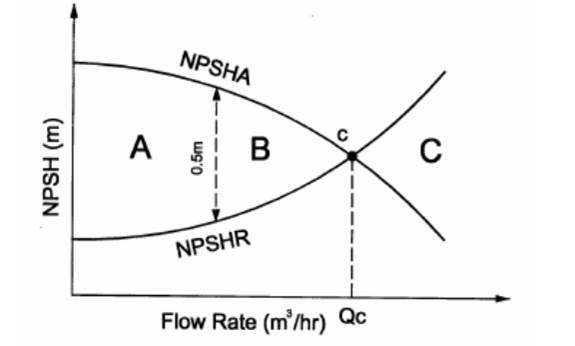 We calculate only NPSHR right? What is the pumping liquid that you have considered? And I'm not able find the K factor and vapor pressure from the charts? NPSHA is available, which we can calculate from the available system. how to find K factor? We got the K factor from 7th outta 11th image.